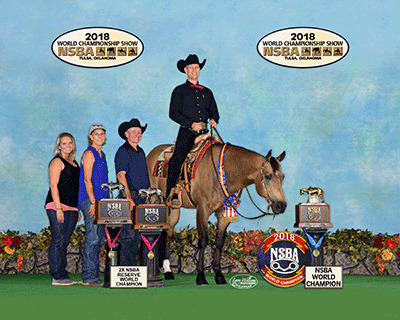 For those who showed at the 2018 NSBA World Championship Show and Breeders Championship Futurity, it wasn’t hard to notice that the show was up over last year. When the final numbers were counted, the show saw an increase of 18 percent in entries over 2017. 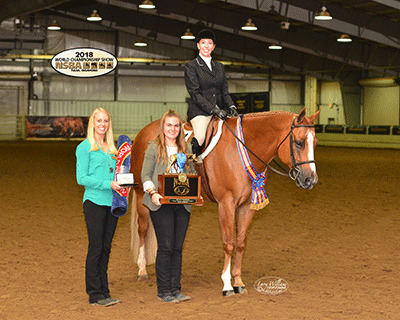 An early review of the statistics showed that the addition of several new Color classes and the division of Youth classes into 13 & Under and 14-18 were well received, and the Ranch Riding classes also showed a significant increase in entries this year. 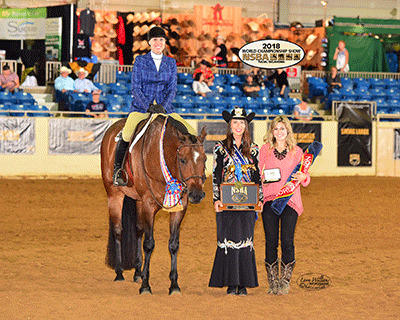 The final champions in the pleasure and pattern pens were crowned on Saturday in the Mustang and Built Ford Tough arenas. 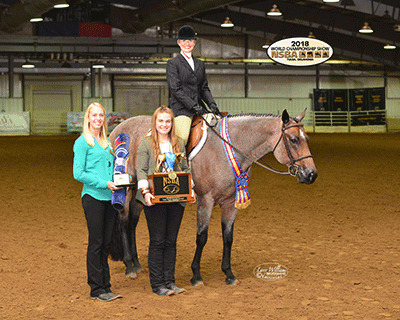 Nicole Kuklinski showed Sketchie Details to win the Maturity Limited Non-Pro Hunter Under Saddle. 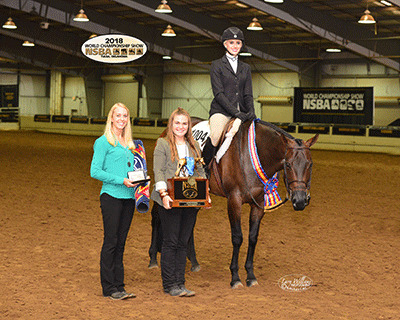 “It’s my first NSBA world championship,” Nicole said. “I’m so excited to get it. “I didn’t get to show Petey at all last year. For as big as he is, he’s pretty soft. He trotted pretty and cantered really well. He’s a lot of fun to show. We show in the Amateur and Non-Pro classes and Keith Miller shows him in the Senior.” Petey is by Hot N Blazing and out of Sentimental Detail. 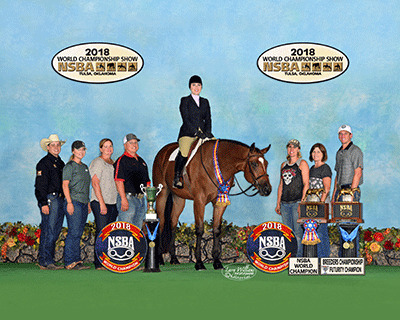 Willy Has Potential added to his championship count at this year’s NSBA World Show by winning the Senior Hunter Under Saddle with Beth Case in the irons. 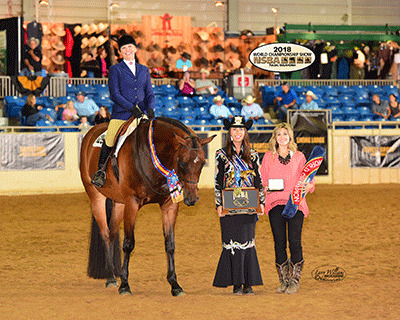 Beth was showing for owner Shelby Ratliff..
Another horse that has seen multiple champion titles this week was HP The Rusty Fox, who won the Three Year Old Non-Pro, Limited Non-Pro and Limited Open Hunter Under Saddle classes with Angela Fox. “Rusty is by the Mechanic and out of Sheza Pleasure,” Angela said. 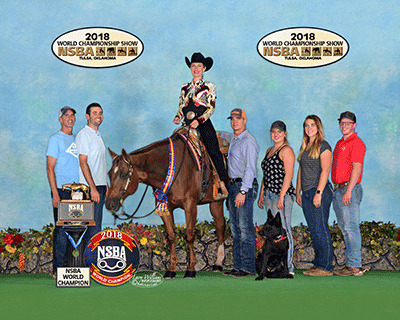 Maid Me Good also earned two NSBA world champion title with owner Rebecca Kazakevicius, winning the Two Year Old Non-Pro Hunter Under Saddle as well as the Two Year Old Limited Open Hunter Under Saddle. “I got him last year,” Rebecca said of the gelding by Good I Will Be. “Beth (Case) said come look at this yearling. When Beth says that, you go. He’s got such a great top line, and he’s very consistent. He’s been so much fun to show. At two, they don’t know all tricks, so he’s so honest. I just sold him to Michelle Bauer, so he will be with Garth and Sonnessa Gooding.”. 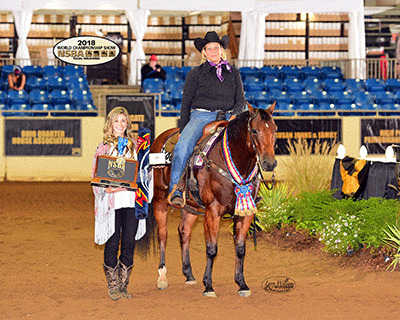 In the Two Year Old Limited Non-Pro Hunter Under Saddle, Lucky To Sleep and Amy Bucholtz took the world championship. Bred by BSB Quarter Horses, Lucky is by Too Sleepy To Zip and out of Dynamic Fashion. “I just got him in February,” Amy said. “He’s got so much body, he trots and he’s super at the canter. He was third in the Limited division and reserve in both Open classes here. We love him. 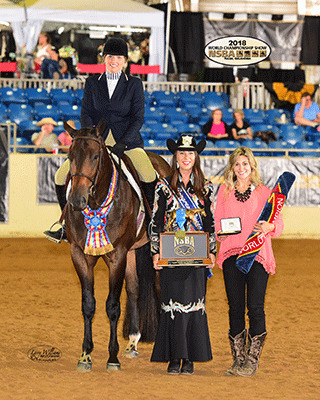 Look N Hott and Laurel Champlin earned the world championship in the Amateur 50 & Over Hunter Under Saddle. “He got a little excited during his victory lap,” laughed Laurel. 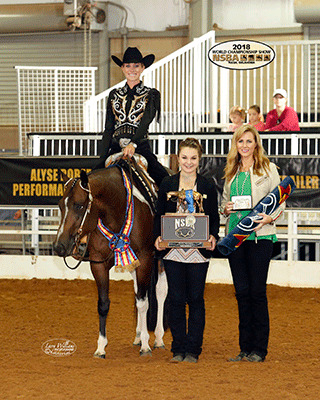 The duo have earned multiple AQHA world championship titles. 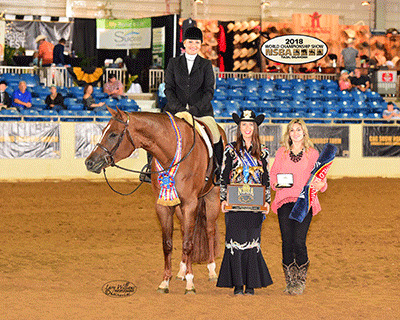 Another first world title was earned by Nicole Bennett and Just Kruzin in Novice Amateur Hunter Under Saddle. Gone Viral earned an Open world championship with Jason English riding in Junior Western Pleasure, to go with one he won earlier in the week with owner Kari Craft. “I’ve always loved this horse since he was a baby,” Jason said of the stallion. Saturday continued to be the day of repeat champions. 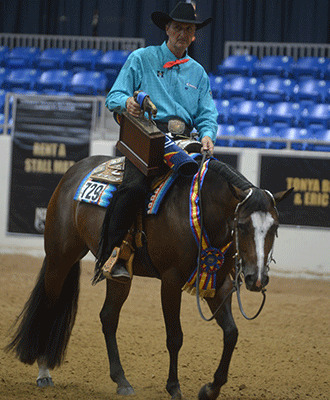 Clay Arrington and Al Be Batting Ona RV also won a repeat world championship, winning the Two Year Old Non-Pro Western Pleasure. 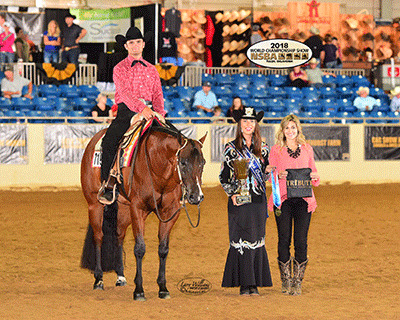 Nick Weiss and Truth And Alibi also scored another world title in the Two Year Old Limited Non-Pro Western Pleasure. Aaron Moses and Lope With Grace also added to their world championship count by winning the Color Three Year Old Open Western Pleasure. 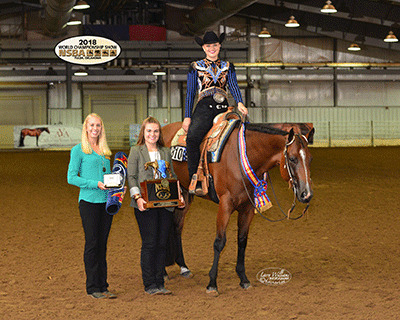 Lope With Grace holds double registrations with AQHA and APHA. 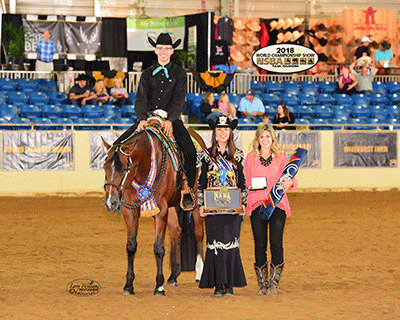 Following up their BCF win earlier in the week, Bailey Anderson and Shez Flat Mystical earned their second world title in the Novice Amateur Western Pleasure. 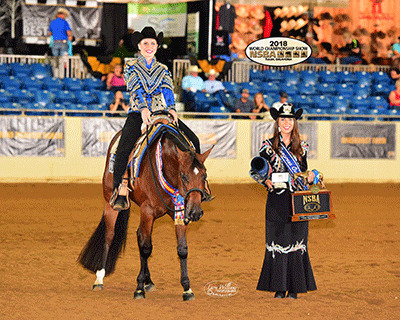 In her first appearance at the NSBA World Championship Show, Jessica Wazny earned her first world championship title with Shes Elegantly Made in the Two Year Old Limited Non-Pro Western Pleasure. The mare known as Lexus is by Machine Made and out of Potential Elegance. Lexus would also give trainer Chase Barnes his first NSBA world championship in the Two Year Old Limited Open Western Pleasure. Livin It Up won a third world championship for the show, this time with Mark Zeitler in the saddle for Aubrey Alderman, winning the Two Year Old Limited Open Western Pleasure. “He’s won three classes here, and he’s stayed good all along,” Mark said. “He’s just a good horse.” Live N It Up is by Red White N Good, and out of Livin Ona Prayer. 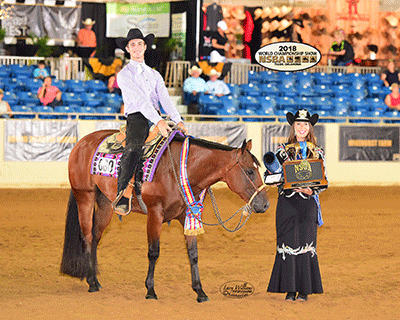 Kelby Hutchinson earned his very first world championship title in America with A Lazy Holiday, whom he showed for Seaside Farm LLC. The young man from Australia is an assistant trainer with Jay and Kristy Starnes. 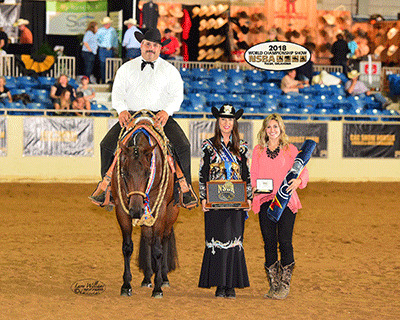 The pleasure portion of the show ended with Gil Galyean and Made By J, showing for Dr. Candace Hall and Cory Seebach earning the world championship in Senior Western Pleasure. The mare known as Jolene was also reserve champion in Green Senior Western Riding earlier in the day. “We’ve got some yearlings out of her that we can’t wait to show, and we plan to breed her next year to our new stallion, Slow Motion,” she said. 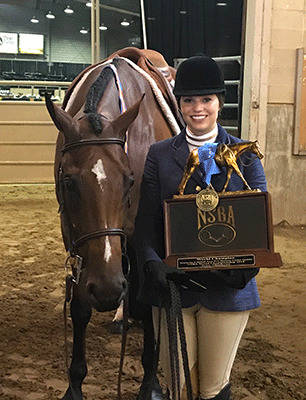 Erin Bradshaw and her APHA horse Elicious earned their first world championship in the Color Amateur Western Pleasure on Saturday. “We bred and raised him, and he’s by our stallion John Simon,” Erin said. In the Color Amateur 50 & Over Western Horsemanship, Gary Holme and Come N Get Ya Some earned their first world championship after earning reserve in Novice Amateur Trail and earning a top ten award in Color Amateur Trail, along with a reserve in the Color Senior Trail with Jeff Mellott. “I found him on You Tube,” Gary said of his horse. 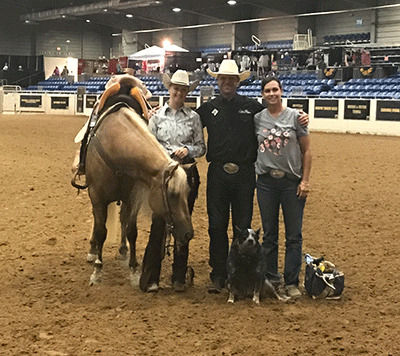 In their very first show together, Kate Toomey Evans and Eyed Be In A Jam earned their first world championship title in Novice Amateur Horsemanship. 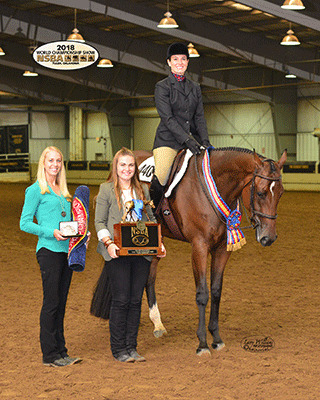 In the Novice Amateur Hunt Seat Equitation, Real Hot Real Good and Janalee Thompson were named world champions. “My favorite part of the pattern was the hand gallop around to that lead change,” Janalee said. Ima Good Margarita and Shannon Brown won the world championship in Amateur Hunt Seat Equitation. “My favorite part of the pattern was going from the right diagonal to the right lead lope. I just felt like he was really listening to my leg and locked in. I just really love the Equitation and felt it was an opportunity for me to push him out a little bit.”. In the final equitation class of the show, Debra Craig showed PF Put It In Park to win the world title in Amateur 50 & Over Hunt Seat Equitation. “I liked the lead change, because we were in a two-point,” Debra said. 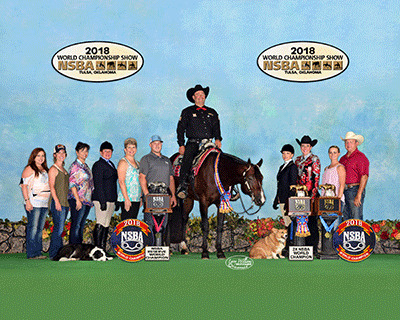 Ranch Riding exhibitors had two opportunities to show over the weekend, in Ranch Horse Versatility classes on Saturday, and the NSBA world show classes on Sunday. 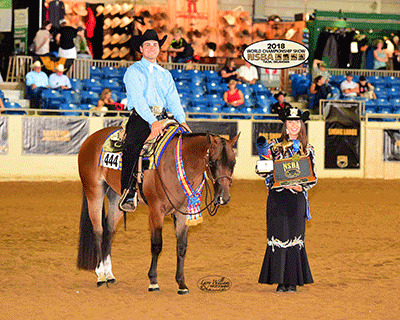 Open and Non-Pro exhibitors each vied for high point titles and a Harris work saddle. Another two-time world champion was Karen Johnson and Gotta Hot Gun, who won the Open Ranch Riding and Non-Pro Ranch Rail. 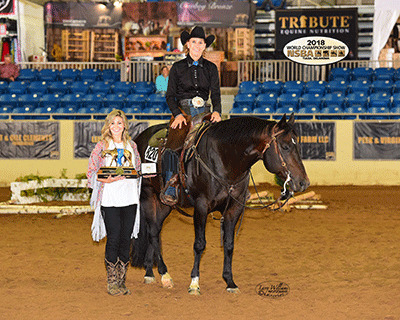 Jennifer Honey and Taking Chances won the Non-Pro Ranch Trail..
GQH Summer Camp, owned by Sara Cook and shown by Robert Johnson, won the Open High Point Ranch Horse award, earning a Harris work saddle for their efforts. “We’ve never been here before, but we’ll be back. 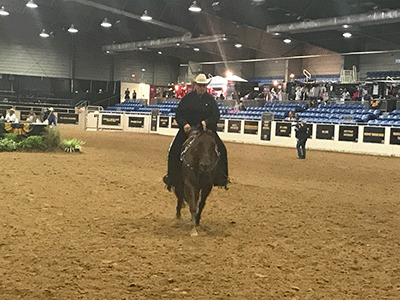 We’ve really enjoyed showing here in the Ranch Horse classes,” Robert said. .
Noel Meadows and Wimpys Major Affair earned the High Point Non-Pro Ranch award and a Harris work saddle. “This is my first time showing him,” Noel said. Complete show results for the NSBA World Championship Show can be found on the NSBA website, www.nsba.com, under the World Show tab.